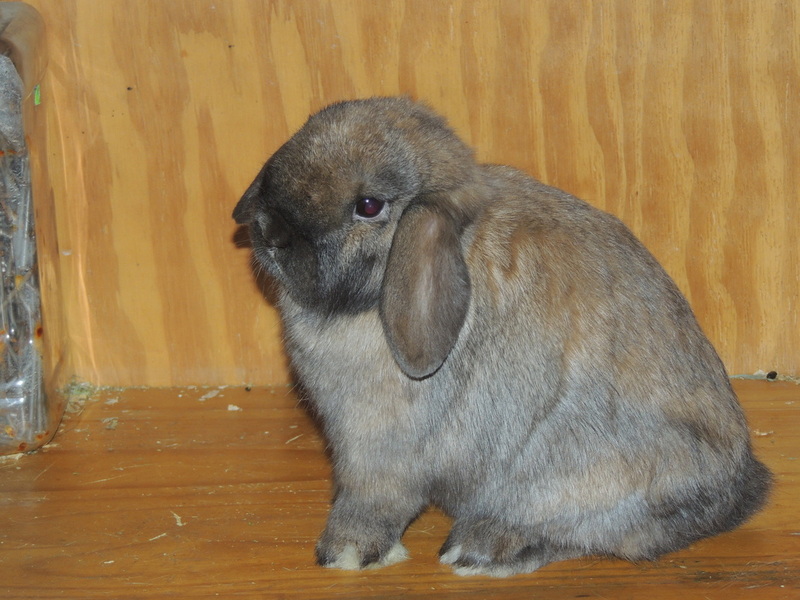 Holland Lops are my newest breed. I am currently working on the Blue Eyed Whites and Brokens!. The broken pattern is the most gorgeous, and is my favorite color in all breeds, so I really want to work on those. Note: I do not stud out my bucks, due to diseases. But doe's I sell, I can breed to my buck's, because they have already been in my rabbitry, and I know the rabbit is free from diseases.Thank you for understanding. Born in August of 2012, died in August 2013. Glacier was a beautiful buck and had a incredible personality like no other bunny. He's dearly missed. His death was by my Mom's dogs while he was out in a exercise pen to run and get time out of his hutch. The last memory is of him running back and forth and pushing his nose out of the bars of the exercise pen. I miss the laughs he brought to me, and his sweet sweet sweet personality and face. I have learned in a very hard way and paid a big price for it, to never trust dogs even if they are nice to animals when you are around. Its very hard to think that I will never see his sweet face again, or to give him his hugs and kisses. You are in prayers my little boy. Jaque is just the most gorgeous buck. Have to get more pictures of him. Big, big head! These pictures do not do him justice! These pictures do not actually show how big his head is! Its much bigger in person. Beautiful buck. Hes really sweet too. Super nice personality. His father is from Critter Coop and he does have some L&R lines in his pedigree too. Thank you so much Tasia T. for this beautiful buck! Chaos is a beautiful buck. Im still trying to figure out why I got him, as I really dont need another Holland Buck! Hes got a really nice head set though he fought me to take pictures. He just wouldnt pose! I cant wait to see what he will produce! Gumby is a very handsome buck! I love his head. He has a nice full butterfly on his nose, and is such a nice buck. He developed Malocclusion biting on his wire, but I havent gotten one baby out of him who has it so it wont be passed to the babies. Havoc is such a cute little buck. Does have a thinner head,but I will just have to wait to see how he turns out. He loves to just sit and pose in his cage! I think he's going to turn out very nice. I got this little buck at convention. He's very tiny in size and I was hoping for a better head and ear, but I will just see what he produces, hopefully he throws babies nicer then him. Though I love his personality. Very laid back and sweet. The 'Buck fever' caught another one of our bunnies! Winter was supposed to be a doe. I thought I had a nice doe. Lol. Though I will still keep him just to see how he turns out and because he's Jaques baby. I still think he will turn out awesome but I was devastated when I found out he was not a Doe!! Rachael is a very pretty doe. She has nice big bone, and a pretty chubby face. She has a big dulap, and I just love those! Though in mid-last year she started going downhill but I got her back on track. I prayed for her and I dont want anything to happen to her if I were to breed her so she's just going to be a Pet here. Que-Tee is a very pretty little doe. She looks like she is going to have "Airplane" ears, and will have ear control. Her ears go straight up. Im making the decision to let her go. She will make a good breeding doe, but I need to downsize my herd, and I dont want to do the Blue eyed whites as much as the other colors. I think they will just be a side color for now, until I get more cages. 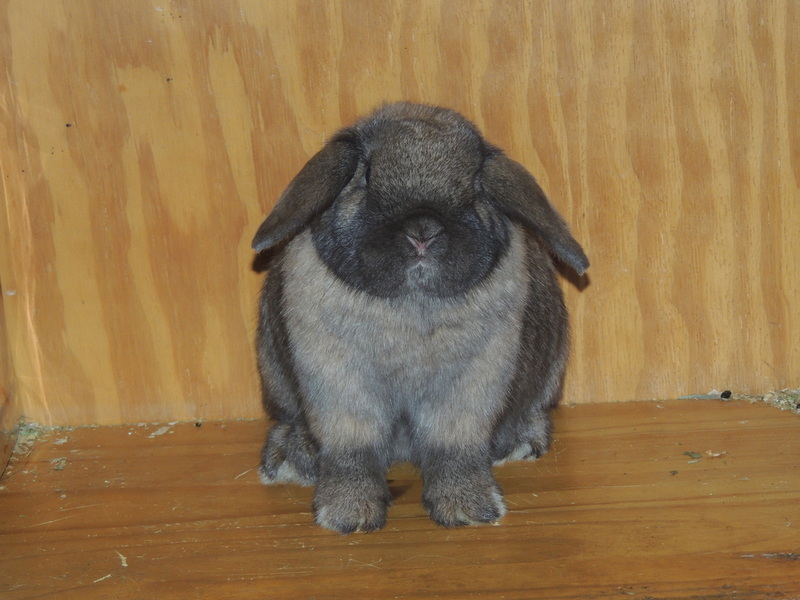 Hunter's Annie - Sold to Desiree R.
Currently has a litter of 2! Annie is a doe I got from the ARBA Convention. She has really nice parents. She has long ears, but they are nice and thick. Summer is another perfect breeding doe. She is molting right now, so I am waiting until her new coat comes in to take pictures. She is mostly from Helmandollar's, but she does have some L&R lines in her pedigree too! I will be breeding her to Jaque as they both have L&R lines and hope to get some nice show babies!! Miss this sweet little girl! I love Joy's color! Chinchillas are one of my favorites. Very nice head on her, through she wont sit up any further then in the pictures. Her crown is a little slipped but Im sure I can fix that with the right buck. Scylla is such a beautiful doe. She automatically poses once I put my hand under her chin. Shes such a sweetie! Does have ear control but not much. Autumn is a gorgeous doe! Not quite as nice as her brother (Mr. Winter) but shes awesome for a doe! Sooo excited! I cant wait to get her and her brother on the show tables this Spring.